The first electric guitar I ever owned was a Japanese-made Vantage VS695 ‘Vamp’, bought from a friend for $150 in the mid-1980s. It has been a great companion over the years, from high school rock bands and into my early twenties when I moved to Vancouver and began using it in the studio during my time in Vancouver as a student at the Trebas Institute of Recording Arts. (Trebas no longer has a Vancouver location). My favourite studio setup with it was through a small Marshall amp using a Boss Compression pedal to give it a bit of boost. I recorded a number of early demos with it. 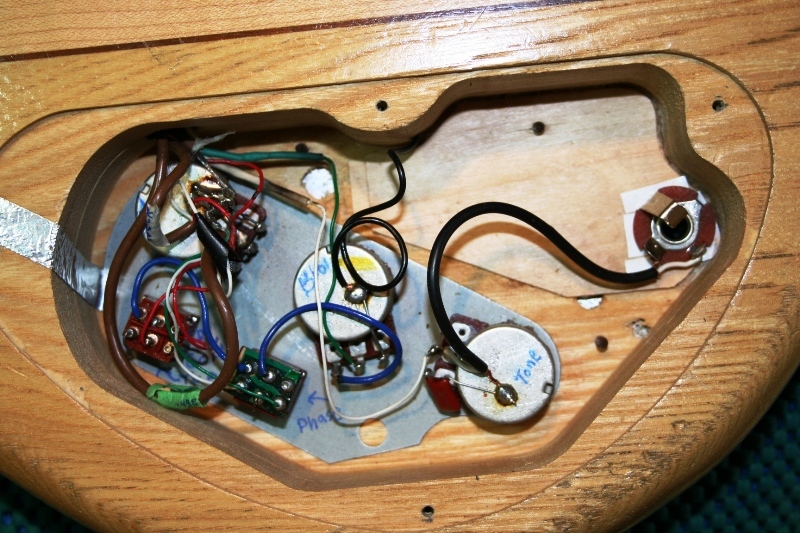 The missing pickup and toggle switch was a result of my own half-baked attempt at modding the guitar in my late teens, while the duct tape is compensating for damage done when my bass player stepped on the cable during a show. That tape is probably over 25 years old! In any case, it still sounds good after all these years, so I took it to a friend here in Edmonton who loves to work on guitars. He’s done some great work for me setting up my other instruments and I presented this to him as a summer project. The ‘Vamp’ in poor condition after a couple decades of use and abuse. Missing pickup, missing toggle switch, damaged body around the input jack. On the workbench in Kurt’s shop. 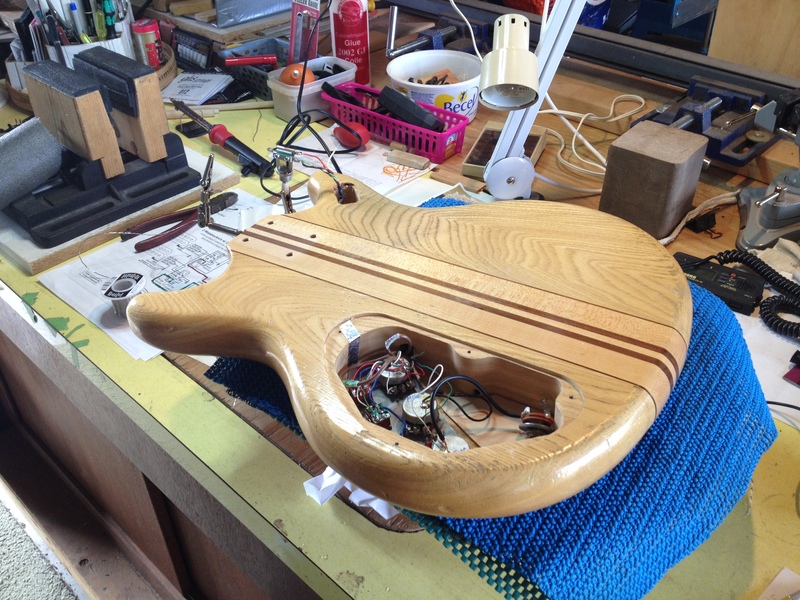 Neck removed and electronics exposed. Initial patch job on the input jack from the inside. Two thin sheets of veneer inside to reinforce the input jack. Kurt has labelled the pots in preparation for reinstalling the pickup and the toggle switch. Kurt found someone online with the same guitar, who had posted photos of the original wiring setup. It’s amazing what that Internet will come up with! Switches and pots labelled. Toggle switch. Second pickup reinstalled (I had kept it in the guitar case all these years after removing it. Close up of the labelling. The VS695 has a coil tap and phase switches, giving it quite a bit of flexibility in tone. For years, I have to confess had no idea what those switches were there for. Thanks Kurt! A think sheet of maple veneer to cover the damage on the input jack and provide some strength. Kurt chose the colour to match the pin striping on the guitar. Close up of the reinforced input jack. Kurt made the extra effort to notch out the plate around the pots to give it a slightly more elegant look. A small ring added to the toggle switch to complement the new plate. A nice touch. And a practically new Vantage VS695 and the Vamp sounds as good as ever. Thank you Kurt for resurrecting this special instrument for me! It was a pleasure to work on the guitar and bring it back to it’s former glory for many more years to come, hopefully. The best part was the anticipation, then subsequent playing and hearing it for the first time after many years out of service. Since all the parts and wiring (except the toggle switch) are original I imagine it sounds just as it was intended to when it was made some 30 years ago. It is a pretty awesome sounding guitar! 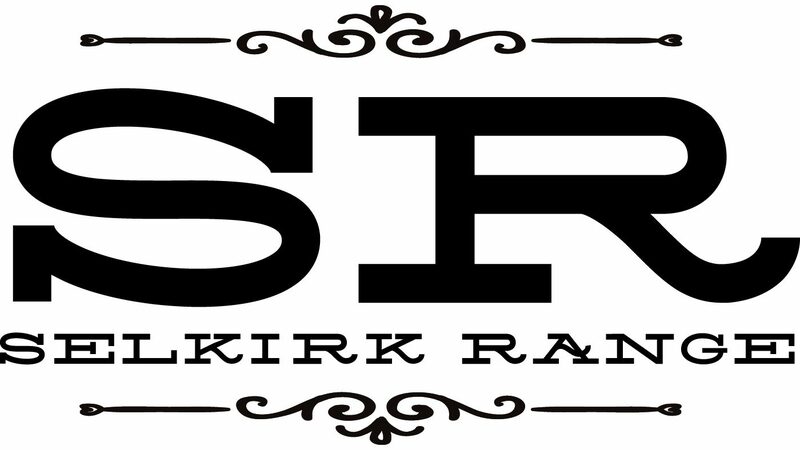 For the record, the idea of using some sort of “cover plate” on the front was Gordon’s suggestion. 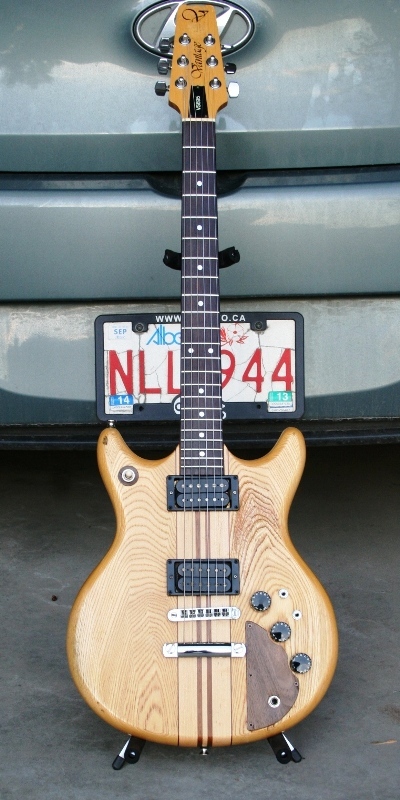 It is actually real walnut veneer (not maple) laminated to a piece of a re-purposed plastic pick guard. 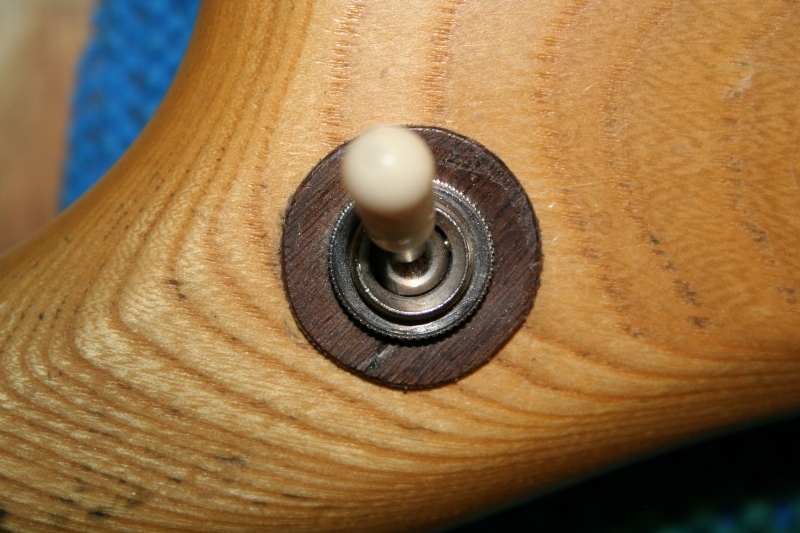 The ring around the toggle switch is made of the same materials. Enjoy playing it as much as I enjoyed working on it. Thanks for correcting the detail about the cover plate Kurt. 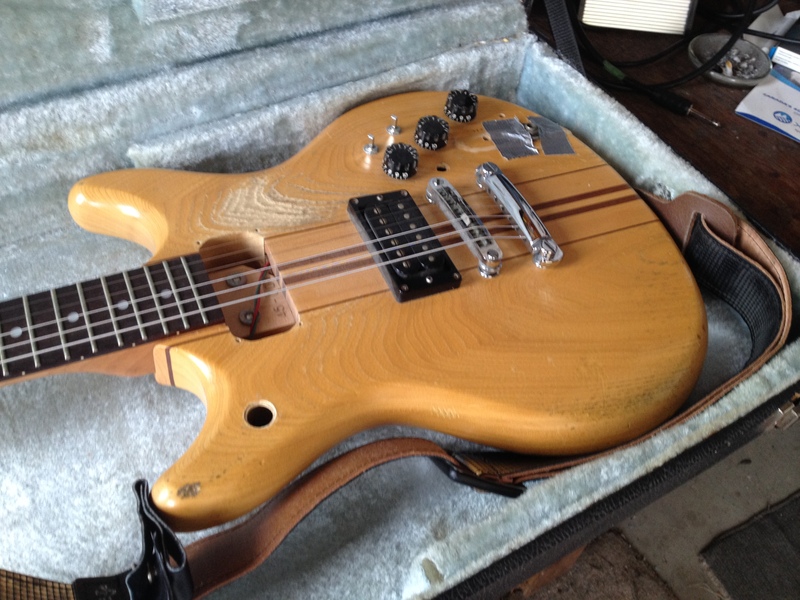 We did also briefly discuss dropping new pickups into it, but on hearing the original ones decided against it. That was a good decision, as they sound great. I can’t tell you how thrilled I am to see this. I live up in Rochester and House of guitars just did pretty much the same repairs for me also had a busted couple of switches and didn’t know what the hell the coil tap and phase switches were either. thanks a million I love this guitar too, has been taking abuse for 15 years now.